Today I was translating an interesting article-Create, Publish and Export Screencasts that from Ghacks which is a very good technology blog, the article introduces an web tool on Screencast-o-matic, that helps you create a video recording of your screen without download any software. Usually, I use a free software that called CamStudio to create something that I want show other people on computer. 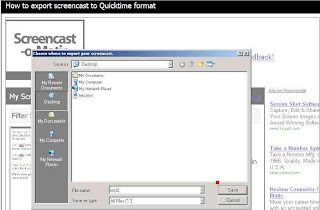 I did not try that tool but I have visited Screencast-o-matic site. It has some demos there, and it looks easy to using. Actually, I wonder how quality and speed is. File export format is Quicktime (.mov). CamStudio can export two kind of formats, flash (SWF) and AVI. I can not say anything about that tool before I try, but more choices better than no choice.